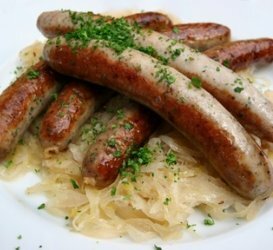 You'll find this popular cabbage dish at the Oktoberfest, wine or beer festivals in Southern Germany, it's usually served with Bratwurst or with good German sausages, Schweinshaxe or any other pork dish. Sauté the finely chopped onion in the butter until tender, add the thinly sliced peeled apples and chopped garlic to the onion. Add the Sauerkraut unwashed to the onions and sauté for a few minutes. Add some water, the juniper berries, salt and simmer covered for 1/2 - 1 hour. More water can be added during the cooking process as necessary. At the end add few tablespoons of white wine as desired. If you cook Sauerkraut in a pressure cooker the cooking time will be drastically reduced to 8-10 minutes total.